Causa Justa :: Just Cause envisions equal rights for people of color, immigrants, women, and all oppressed and exploited people. We envision an end to racism, and want to build a society based on self-determination, social justice, and solidarity. We envision a future without displacement through real estate speculation and forced migration. We envision a society where housing is a human right and all families thrive. We envision a future where corporate control is replaced by an economy run by the people and for the people, and political power is in the hands of those who need change the most. We envision a restoration of balance between humans and nature, and an end to ecological plunder. We believe that bringing together Black and Latino people is a crucial part of building a multi-racial people’s movement in the US that contributes to a global movement for liberation. We are hiring for a bilingual Tenant Counselor/Organizer to work in our San Francisco office providing advice and housing counseling in Spanish and English to residents several days a week. § Represent, advocate for, and/or translate for tenants at the San Francisco Rent Board, Small Claims Court, and Settlement Conferences, as appropriate. § Familiarity with San Francisco including – local history, geography of the city / neighborhoods, knowledge of various organizations, political issues and players etc. § Fully bilingual in Spanish / English – including the ability to translate written documents from one language to the other. Native Spanish speakers preferred. Position is Full Time and the salary range is between $40,000-$43,000. Position is open immediately. Deadline for application is March 20, 2013. People of color and women are strongly encouraged to apply. Please email resume and cover letter to jobs@cjjc.org. Fundraising with CJJC is an opportunity to work in a dynamic team with one of the most cutting-edge movement building community organizations in the country. At CJJC, you’ll be able to contribute your strong leadership and strategic thinking skills to move forward what an already strong fundraising strategy that supports a $1 million+ budget. We are looking for someone who is a leader, motivated, energetic and excited to make a strong contribution to social justice. At CJJC, you’ll work closely with the Executive Director and lead a team made up of a Grassroots Fundraising Organizer and Grantwriter, working in close coordination with the Communications Team. Fundraising is part of CJJC’s political work so you’ll be fully integrated with the staff (no being isolated in a corner in front of a computer!). From foundations, government contracts, grassroots fundraising, and a new earned income stream, you’ll be able to both make a big contribution to social justice movement building AND expand your skills. • Ability to manage a large body of work, attending to both details and the bigger picture. Position is full-time. Salary is 45-50k, plus full health, dental and vision benefits. Position is open until filled. People of color and women are strongly encouraged to apply. Please send resume and cover letter to jobs@cjjc.org. Position is open until filled. 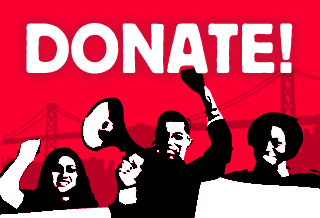 Causa Justa :: Just Cause (CJJC) is a multi-racial, grassroots organization building community leadership to achieve justice for low-income San Francisco and Oakland residents. CJJC is looking to hire a temporary, part-time Volunteer Coordinator for six months (June- December, 2013) at 20 hours a week while our existing Volunteer Coordinator is out on parental leave. The Volunteer Coordinator manages the day-to-day volunteer and internship program of the organization, including supervising 80+ volunteers in two cities. Position is temporay, part-time and offers $20,000 annual salary DOE. Pro-rated health, dental, vision and life insurance benefits are included. Position begins June 8, 2013. People of color, women, and transgender people are strongly encouraged to apply.